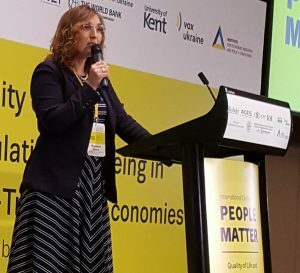 International Conference “People Matter: Quality of Life and Population Wellbeing in Post-Transition Economies” organized by the Kyiv School of Economics and VoxUkraine on September 14-15, 2017 in Kyiv in Ukraine has ended. See the full program of the conference. The organizing committee of the conference included GLO Fellow Olena Nizalova (University of Kent), Yuri Gorodnichenko (University of California, Berkley), Tymofiy Mylovanov (Kyiv School of Economics and University of Pittsburgh), Mariya Aleksynska (ILO), and Olga Kupets (Kyiv School of Economics). GLO Fellow Sergei Guriev (Chief Economist of the European Bank for Reconstruction and Development and Professor at Sciences Po in Paris) in one of his many presentations to the conference on Friday, September 2017. In 2004 – 2013, Guriev was a tenured Professor of Economics and Rector of the New Economic School in Moscow. 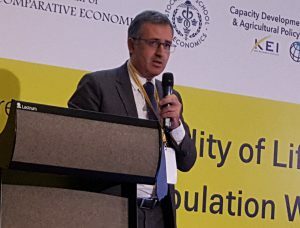 He spoke about the “Happiness Transition” in Eastern Europe, discussed on a panel the role of international organizations for population wellbeing, commented on the interaction between religion and communism and spoke about “What prevents people in post Soviet countries to be happy?”. 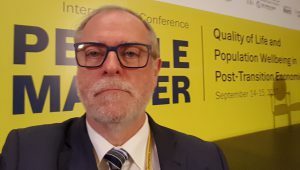 On the first day of the conference on Thursday, September 14, Klaus F. Zimmermann (UNU-MERIT, Maastricht University and President of the Global Labor Organization – GLO) had provided a keynote lecture on “Migration and Wellbeing”. He also chaired a policy panel on “Migration caused by conflicts: Wellbeing of refugees and internally displaced people”. ►A. Akay, A. Constant and C. Giulietti: The Impact of Immigration on the Well-Being of Natives, Journal of Economic Behavior & Organization, (2014), 103, 72-92. ►A. Akay, A. Constant, C. Giulietti, and M. Guzi: Ethnic Diversity and Well-Being, Journal of Population Economics, (2017), 30, 265-306. ►M. Kuroki: Racial Diversity, Immigrants and the Well-being of Residents: Evidence from US Counties, Forthcoming, Journal of Population Economics, (2018). https://link.springer.com/article/10.1007/s00148-017-0657-9; GLO Discussion Paper, No. 76. ►N. B. Simpson, Happiness and Migration, in. A. Constant and K. F. Zimmermann (Eds. ), International Handbook on the Economics of Migration, Edward Elgar, (2013), 393-407. ►W. Betz and N. B. Simpson, The Effects of International Migration on the Well-being of Native Populations in Europe, IZA Journal of Migration, 2013,2. Akay, O. Bargain and K. F. Zimmermann: Home Sweet Home? Macroeconomic Conditions in Home Countries and the Well-Being of Migrants, Journal of Human Resources, 52 (2017), 351-373. ►A. Akay, C. Giulietti, J.D. Robalino and K. F. Zimmermann: Remittances and Well-Being among Rural-to-Urban Migrants in China, Review of Economics of the Household, 12 (2014), 517-546. ► A. Akay, O. Bargain, C. Guilietti, J. D. Robalino and K. F.Zimmermann: Remittances and Relative Concerns in Rural China, China Economic Review, 37 (2016), 191-207. ►M. Nikolova, M. Roman and K. F. Zimmermann: Left Behind but Doing Good? Civic Engagement in Two Post-Socialist Countries. Journal of Comparative Economics, 45 (2017), 658–684.